How do I attract analyst research coverage? Analysts are probably the most important gatekeepers to the capital markets. They act as a spokesperson on behalf of your company. They speak to their sales desk, retail investor networks, institutional clients, and they are often quoted in the media. In some cases, broker-dealers will not allow their retail broker networks to trade your shares without active analyst research coverage from one of their own analysts. So how can your company get a broker-dealer to allocate analyst research coverage to your story? Analysts do not (and should not) launch research coverage overnight. To obtain coverage from an analyst requires a much broader understanding of how capital market relationships work. You therefore need the patience and discipline to develop healthy broker-dealer relationships over the long-term. The first step is to determine who you would like coverage from. It is important to note that not all broker-dealers will be a good fit for you at any given time. Certain broker-dealers will be a better fit with the size, situation, and stage of your company than others. It is important to target and prioritize the right group of broker-dealers and sell-side professionals to ensure you receive the highest level of service and performance. Search for sell-side analysts that cover your industry using an investor relationship management system. Look at the market cap and nature of the companies they cover, and compare that to yourself. You should be targeting analysts that cover companies close in size and function to your own. The StarMine – Thomson Reuters Analyst Awards ranks analysts annually based on the returns of their buy and sell recommendations. Have a look at who the top ranked analysts are for your sector. Once you know who you want to cover you, then the next step is to begin making regular calls to the director of research and the research analyst. Ask to arrange an introductory meeting to build a relationship, and once that happens, routinely follow up with updates. Then you’ll also want to make contact with the broker-dealer’s investment banker that covers your sector. Over time you will get to know them, and they will get to know you. While European in origin and effect, MIFID II forces all entities marketing financial products in Europe to break out what they pay for research separately from what they pay for trade execution. The intent of the legislation was to create more transparency for end-users. However, since coming into effect in January 2018, MIFID II has created a cloud of uncertainty over the sustainability of analyst coverage and the broker-dealer business model. Broker-dealers that market financial products to funds or entities based in Europe now have to price research separately from trading execution. In other words, a broker-dealer can no longer provide research for free in the hopes of making money on trading commissions. MIFID II has disrupted the funding model for sell-side research and corporate access. While specific for all financial products sold in Europe, the impacts are global. European sell-side conferences are being cancelled. Sell-side analysts are leaving or being laid off in droves. The new reality is that it is now much more difficult to attract and maintain research coverage. Public issuers need to be prepared for longer lead times in establishing a research within a shrinking analyst universe. Prohibit analysts from soliciting investment banking business. I am saying “financial returns” because the word “compensation” is likely to offend everyone’s sensibilities. But let’s call a spade a spade shall we? If a broker-dealer provides you with research coverage they will expect to eventually get compensated through participation in raising debt or equity on behalf of your company or through merger and acquisition (“M&A”) advisory. That said, for companies that are not regularly raising debt or equity capital and are not engaging in M&A transactions, it is still possible to obtain research coverage. However, it might take a bit longer. Credible broker-dealers understand that a mutually beneficial relationship generates more value in the long-term. As a result they are patient enough for the relationship to mature to the point where coverage is launched before expecting to be included in your syndicate. Finally, you manage to attract some research coverage. And then more analysts join in. Now, you have multiple broker-dealers that want to take you marketing and be a part of your capital syndicates. If you’re successful at attracting analyst research coverage, eventually you will be unable to accommodate the wants/needs of all the broker-dealers covering you. This is called being “over-brokered”. Which broker-dealers have provided the best broker-dealer support over the long-term? Your answer should be based on an analysis of trading and the success of the buy-side relationships (both institutional and retail broker) facilitated by the broker-dealer on your behalf. Measuring the latter depends on what information you have captured in your investor relationship management system. Which broker-dealers are the right match for you in terms of size, service, and industry coverage? My only caution on the third criteria is that, as humans, the quality of our judgement on who to trust can be off at times. The first two criteria are more objective, and should carry more weight in your decision making. There is certainly a correlation between market capitalization and analyst research coverage. We conducted a regression analysis in November 2015 for TSX listed companies comparing market cap to analyst coverage. 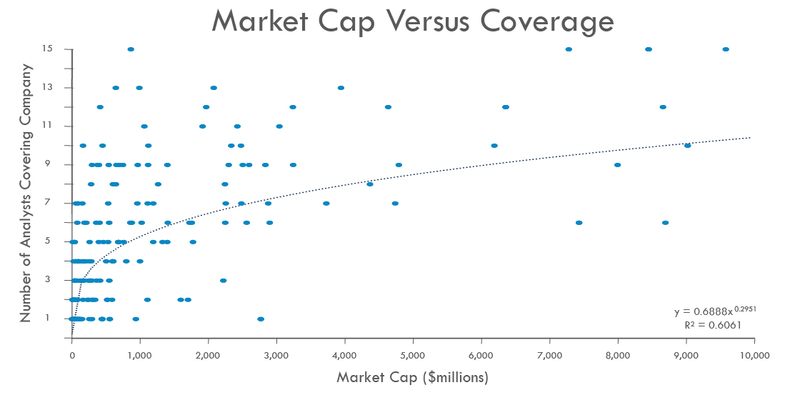 It showed that market cap explained roughly 61% of the distribution of analyst research coverage. This makes sense as the bigger a company is, the more active they tend to be in raising capital and engaging in M&A deals. Therefore they tend to be more attractive to broker-dealers. That said, there is still plenty of room for your investor relations program to influence your analyst research coverage. 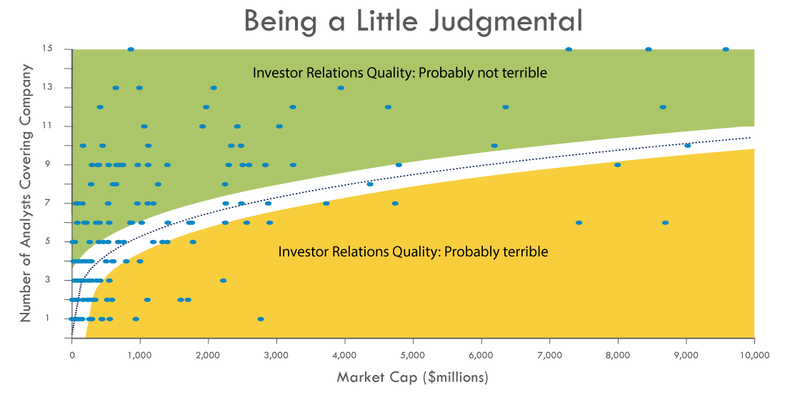 For companies below the trend line, it is easy to cast judgement about their investor relations. In broad strokes, we can probably say that the companies in yellow could probably benefit from better investor relations. While the companies in green probably have decent investor relations. There are a variety of non-dealer firms that offer public companies research in return for money, equity or options. The capital markets have traditionally put zero faith in this research. My recommendation used to be: “Avoid paid-for research at all costs”. However, in a post MIFID II world, paid-for research may become a necessary evil. Established broker-dealers are even considering a pay-to-play approach for research as they seek to find a viable funding model for the research they provide. However, until this model is established and proven, paid-for research should be considered a waste of resources and a threat to your company’s credibility. Thank you for reading this article. If you liked it, please share it on social media.